Home » BLOG » How to tell if a relay is bad in a car? How to tell if a relay is bad in a car? What is a relay? Car relays can come in all sorts of shapes and sized and they all look very different but have similar functions. In general, they are used to change the amps going to a specific part of your car by switching on or off a higher or lower amp circuit. For example, if you want to turn on your headlights you wouldn’t hook it up directly to the switch as it might push too much electricity to the lights and end up burning out some wires or your lights. Additionally, relays are used in order to allow you to connect multiple devices to it but yet regulate the number of amps going to it. If you need higher levels of energy the relay will switch in and push more electricity through. If less is needed it will switch off and push a smaller amperage through. Why is a relay requited? You’d want a relay for a few different reasons. One reason you may want it is to conserve energy which in turn will conserve gas in your car when less energy is needed. It also helps improve the overall efficiency of the car. The bigger reason is it will help extend the life of the specific device (lights, or other electrical devices) including wiring and other products. This helps to extend the overall well being of your car and ensures it needs less maintenance over time. A typical relay will last up to 100,000 times operated. Meaning each time you turn on and off your lights that will start ticking down the life of the relay. This can often take years to happen but will need to be checked from time to time. If you can find the relay and easily access it, you can also easily test it using a multimeter device. If you are unsure where a specific relay is or how to access it, refer to your car’s user manual for more information. This is a very low-risk task which will not require much safety equipment, but as always eye protection and gloves are recommended if you are not an experienced user. If ever you are in doubt, consult a professional. Step 1: Determine the configuration of the relay so you can understand which two poles are the normally open(NO) and normally closed(NC) contacts. These are important because electricity usually flows through the NO contacts until the relay is switched on in which then the NC contacts will open. Step 2: Begin by testing the relay before it is energized (make sure there is no electrical supply going to the relay). Using your digital multimeter, select the setting for ohms (with the Ω symbol). You can select the lowest setting at 200 ohms. To know which one is the NC or NO, you can easily test the relay by touching the black probe to one side and the red probe to the other side of the relay. The NC contact should read at 0 ohms (or near enough). The NO contact should read infinite which usually on your multimeter will be a 1 at the very left side of the screen. Step 3: You’ll want to energize the relay by getting a power source – usually a 12V battery and connect the power source to the NO relays. The cords from your 12v battery should have a clamp on it so you can clamp it to different ends of the NO relay. Once you’ve attached the clamps to each side you should hear a clicking noise inside the relay. If you don’t hear a click then either your power source is not working or your relay is bad. Step 4: once you hear the click, you know your relay is energized and is ready to be tested. Next, simply touch your multimeter red and black probes to the opposite sides of the relay. Once connected you should see on your multimeter screen either 0 or close enough to zero within a decimal point. If your relay is bad, upon attaching your multimeter to the relay you still see the infinite symbol on the screen, the relay is bad and must be replaced. While some technicians stop testing the relay after energizing it, many times energizing it alone and hearing the “click” sound is not enough as the relay may get energized but there is a fault in the relay which has caused the circuit to not be able to be complete. What is a good multimeter to test relays? There are many great multimeters to use when testing for resistance (ohms). If you are using this for a DIY home type task, you can typically by a cheaper multimeter which will do the job right but may not be 100% precise and may not last as long. If you are working at an automotive shop, then you may want to go after a more well-known brand like the Fluke brand multimeters. While this is one test you can do on your vehicle that will save you time and money from going to an automotive shop, there are also many more ways of testing different devices within your car and other small machinery within your home which saves you time and money. Invest in a multimeter today. It may be the best home device you could buy to make you the most efficient DIY home technician ever! 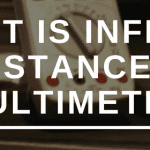 What is infinite resistance on a multimeter?